Digital Signatures add a layer of security to documents that can help lessen the amount of steps needed to sign up to your services. Valid contracts and authenticate documents with customizable electronic signatures that can adhere to any standards or regulations across the world, including eIDAS, UETA and ESIGN. Our technology can be integrated with any PDF documents, like smart forms and is compliant with PDF 2.0. A digital signature is a digitally generated representation of a person’s identity through either an image of a persons signature or a computer generated typed signature which verifies a person’s identify and authenticates the contents of a document. In technical terms digital signatures are generated public key encryption that confirms a person’s identity in order to substantiate a document for legal or other purposes. Digital signatures can happen at page or document level depending on regulation and company standards. Page level digital signatures are easy to recognize and implement. They are distinguished by a single line in a document synonymous with signing paper documents and can be both ink or digitally written signatures. This method of signing is great for contracts and other legal documents. 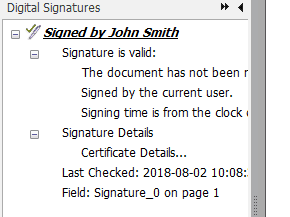 With document level signatures, the existence of a signature is not as obvious as it lies outside of the physical file, under the ‘Manage Digital Signatures’ panel in PhantomPDF. Using document level signing is popular in the engineering and compliance fields where numerous people need to read documents but the original document needs to remain unchanged. For traditional businesses who like to own much of their workflow through using paper and dealing with customers face to face, the idea of digital signatures seems like a impersonal and inefficient way to do business. But experience has taught us the opposite. Banking use to be a very personal affair where customer visited branches to transfer funds and take out loans. Now, through smart business decisions, banks have fewer branches and more of an online presence but customer satisfaction has never been higher. Banks are investing more than ever in technologies that can automate their workflows so that staff can spend more time going the extra mile for customers. The old way of doing business for banks is now showing its true colors and people are seeing the inefficiencies that are abundantly clear now. Doing a Cost Benefit Analysis is hugely important when deciding whether to invest in technology. But when considering digital signatures and the market that it opens up to a traditional business the benefits largely outweighs the cost. With digital signatures people can do business from the comfort of their home so they don’t need to visit a physical store. Staff don’t need to be physically present to verify signatures, meaning that they are free to do more important aspects of their jobs. Digital signatures are recognised across the world so documents are legally binding just like papers ones. No need to scan them; as a PDF document they are ready for digital archiving and can be sent to the necessary departments via email in seconds. Many companies use forms in their workflows which act as a discovery stage before a customer signs on the dotted line. Digital Signatures can be integrated into PDF forms whereby a user can fill in a form and after all fields are complete, they can sign the form to verify the information is correct. This information can then be used to draft contracts and other documents including the digital signature, which creates automatic and efficient workflows within many different industries. Improve, streamline and standardize your documentation by axing the manual process of paper posting, archiving and faxing. With digital signatures you can truly make your business electronic while also saving time and money. Introduce a process into your company that reduces the complexities of predefined activities, while reducing costs associated with document storage, security and delivery. Insurance companies all suffer from a backlog in contract sign off when it comes to veting and compliance. Why make this process any harder than it already is. Introduce digital signing into your workflow and capture customer signatures without setting up meetings and allowing them to do so in the comfort of their own home or office. Keep things simple with digital signatures. Banks are fraught with rules and regulations to follow that can be confusing and cumbersome to enact. Digital signature can shorten the time it takes to complete workflow while also ensuring that you commit to all the regulations around document verification and authentication. There is no need to invite clients down to their local branch when they can sign from their mobile device in the click of a button! // Add a new signature to page. // Set values for the new signature. // Set appearance flags to decide which content would be used in appearance.